While Craggs has so far painted thousands of people’s nails, she knows there is much more to do. Which is why she’s gone back to Nail Transphobia’s beginnings, by turning it into a hashtag, #NailTransphobia. “I can obviously only do people’s nails who come to my events but I want people to be able to get involved from all over the world because transphobia is a global problem and not just one here in the UK. So to celebrate the campaign’s fifth birthday, I decided to go back to its roots and launch a social media campaign, encouraging people to be visible and vocal trans allies.” Her solution? Asking people to paint their middle finger and take a ‘nailfie’, a nail selfie, and post on social media with the hashtag #NailTransphobia. To celebrate the campaign launch, Craggs has teamed up with filmmaker Nova Dando to create a fun step-by-step guide to how we can all give transphobia the finger. Below, the activist tells us more. Tell us a little more about the reasons for launching the online campaign and what are your goals for it? Charlie Craggs: There is a new wave of transphobia coming from the TERFs (trans exclusionary radical feminists), who are basically ‘feminists’ who don’t believe that trans women are women, and they have a very loud voice in the media. These nailfies infiltrating social media is a way of sending a message to people harbouring transphobic beliefs that it’s not okay. 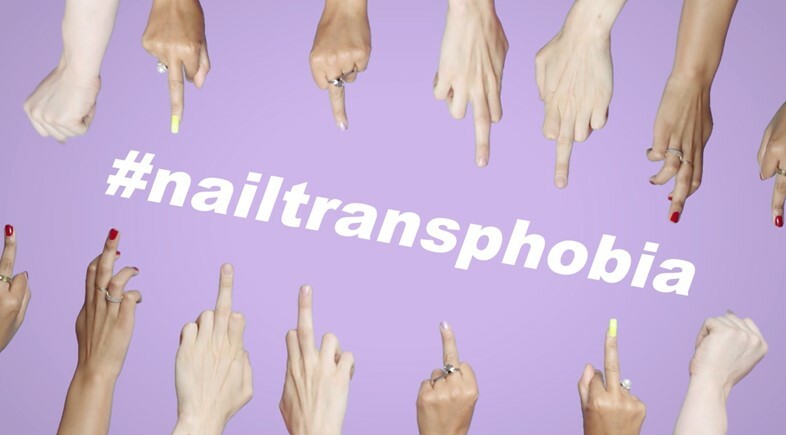 #NailTransphobia targets allies specifically – why are they so instrumental for this project? Charlie Craggs: Allies worldwide are essential in the progression of any social cause but especially in the case of trans rights, because there are so few trans people in the world. I've heard a few different numbers, but it's predicted we make up about 1 per cent of the global population, so if we really want to see a change in attitude or a change in legislation, we need allies on our side to amplify our voices and put up a united front with us. This is why I set up this online hashtag facet of the campaign, because I want as many people to get involved as possible. So far, people have only been able to get involved if they come along to one of my pop up events, but this new online facet of the campaign means anyone from anywhere in the world can get involved and join the movement from their bedroom, so long as they have a bottle of nail varnish and a camera. Social media can help to spread the word, but it also has its downsides – how do you navigate the social media terrain? Charlie Craggs: Social media is rife with transphobia, but so is real life. So I just navigate social media the same way I do real life and I just ignore the haters. Having said that, I think it's important to not just speak into an echo chamber as an activist, so I make sure to do work that brings the conversation to an audience who needs to hear it, even if that means putting your neck on the line and getting abuse on social media. I did a piece for Vice at the start of the year and I'm still getting transphobic abuse in my DMs to this day, almost half a year later. There’s also a big responsibility placed on your shoulders as an activist, how do you deal with that pressure? Charlie Craggs: I feel like this same responsibility and pressure would be there regardless of whether I actively put myself forward as an activist or not. Often people from marginalised communities are forced to be activists whether they like it or not. I was doing activist work in my everyday life without even meaning to anyway, so I figured I might as well call myself one and do it properly. The only difference is that I get more abuse now because I've put myself out there, but in a similar sense, I was getting abuse in my life anyway. Being vocal and visible just means I get slightly more, but I can also achieve so much more by being vocal and visible. It’s a means to an end. Let’s talk about the film. The film is really diverse and inclusive, what was your casting process like? Charlie Craggs: I can’t really take credit for the diverse casting – though I was hoping it would be that way. I just put out a casting call on my Instagram and it got to the point where we were literally having to turn people away. I think it’s really beautiful that such a diverse array of people were willing to stand up publicly and be counted as a trans ally, especially because all these babes all came out to film it on their bank holiday. I really hope that online participation in the campaign continues to be just as diverse. Lastly, how was collaborating with Nova Dando to create this film and what was behind the idea for it? Charlie Craggs: It’s crazy actually because I’ve been a fan of Nova's work and followed her on Instagram for years. She was a guest lecturer on my degree (BA Creative Direction at London College of Fashion) and I had a one-on-one tutorial with her on my final major project, which was actually Nail Transphobia! So it’s so weird that now five years later she’s directing my first ever film for the campaign. ILLUMINATI CONFIRMED.